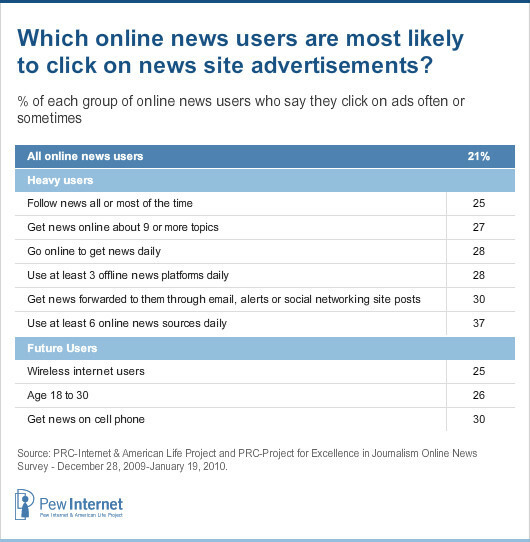 Pew Research Center released a great study, "State of the News Media 2010" on internet users and the numbers behind advertising effectiveness and the monetization of original content. The data below show the surprising effectiveness of online advertising. 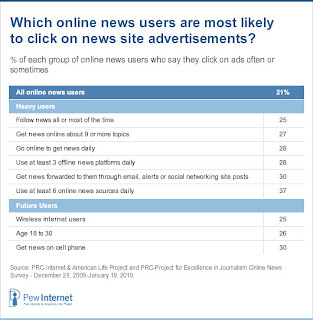 Among all online news users, a full 21% say they "often or sometimes" click on ads. I actually find these results to be fairly impressive. While the implication of the study seems to be the difficulty in online advertising, I'm amazed so many people do click on ads. Considering how much I pay attention to ads on TV or within newspapers, I would think this is a fairly high conversion rate. 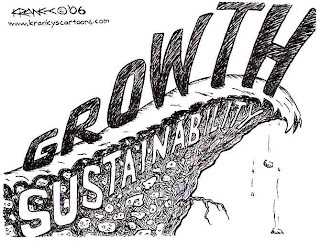 Ads online allow for direct action to be taken by the consumer whereas most other forms of advertising would typically be far less effective in motivating real action on the part of the consumer. This chart demonstrates the difficulty traditional newspapers and magazines are having finding a way to monetize their content. While online advertising has proven to be somewhat effective, the proliferation of content allows consumers to quickly find their news elsewhere. 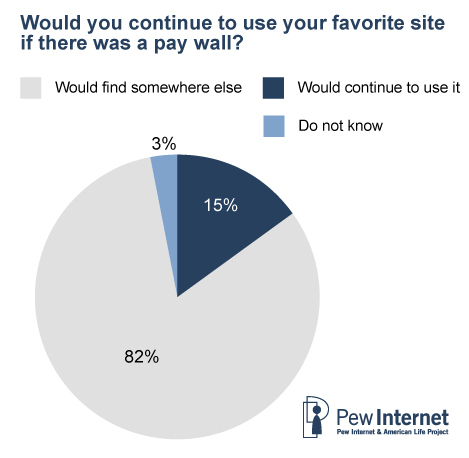 A large majority, 82% of people, say they would simply find their content elsewhere if their news service began charging. This is coupled with the nearly 2/3rds of people who say they do not have a favorite website. In the age of free content, a new model will have to emerge. I don't think anyone has figured out that model yet.